I know I’m late to the party. I always am. It’s a money-thing, I’m always a good year-or-two behind everybody else when it comes to the latest games console or smart phone. So everything I say here will probably have been said already somewhere else. Still, I like to have my say. I rented my DreemFlix console from the Blu-ray shop. ‘Try before you buy’ and all that. It was fine. There was a natural worry about the contacts, who had used them before me and what, exactly, had they been doing with them but it was no fear that a single Dettol Wipe (sponsored mention) could not quickly allay. I didn’t feel ready for the full ‘new title’ experience, given what I’ve read so I settled for a fairly straightforward port of that old classic ‘Casablanca’. It’s not even a firm favourite of mine – don’t get me wrong, I like it well enough – I just didn’t want to ruin a real-fave if it all didn’t quite work out for me. The technology is simple. The box, which is approximately PSX sized, connects to the PC via HDMI and there’s a tiny WiFi matchbox-sized gizmo that sits on the bedside table. The sensors are just little round pads you fix to your temples – you don’t need the groin ones for ‘Casablanca’. So you wire yourself up and climb into bed then do whatever you do, read a book, watch TV and then you sleep. The sensors know when you’ve reached a comfortable and stable REM and then it kicks in with the movie. ‘Simples’, like that Meerkat (sponsored mention) always says. The manufacturers are keen to point out that the use of DreemFlix does not provide a good night’s sleep. It’s like a night-out at a party rather than a restful snooze. Although you’re in REM most of the time, you are being stimulated in all kinds of ways. It certainly isn’t restful. So, enough with the technology that we all know, Kenneth, what did you make of Casablanca on DreemFlix? Will you remember the experience ‘As Time Goes By’? (Sorry). In truth, I was quite disappointed. It reminded me of the various spates of 3D movies that have occurred down through the decades. They purported to add something to the experience but in fact they were a gimmick which somehow ultimately lessened the experience. 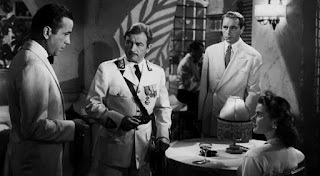 Don’t get me wrong, Casablanca on DreemFlix is fun, it’s diverting, it’s actually a bit amazing too… for a while... but the gimmick aspect quickly wore off for me. The boundaries of the experience are tightly set. Doors don’t lead anywhere and extras don’t do very much at all. You quickly feel like you are in a small room and that there is nothing beyond. To be fair, ‘Casablanca’ is ‘Casablanca’ and the designers of this dreamcast only had limited raw material to work with. You can move around Rick’s Café and watch the action from various angles. You can study characters up close while the main action is occurring elsewhere. It’s cool. But you can tell where doubles and computer-trickery have been used to give a back-of-head shot. It’s well-done but not well-enough-done to be wholly convincing. Key scenes have been polished so that they really shine. When Dooley plays ‘As Time Goes By’, for instance, you can sit beside him on his stool, you can put your finger in the spilled booze on the top of his piano. You can even plink the upper keys of the piano, it doesn’t put him off his stride though, he just keeps on playing. Perhaps that’s the main problem. You’re there, you’re apparently interacting, but nothing you do really impacts on what happens. It’s a film and it runs through and just because you’re standing beside Peter Lorre or sitting with Claude Rains, it doesn’t make all that much difference. It’s like a tour of an art gallery to see the back of all the paintings – a different aspect, sure, but not all that edifying. Many of you will say I did not give the technology a fair spin. ‘Casablanca’ is ancient, you need to try it on a new custom-designed movie, that’s where it shines. Or even something a bit more recent like ‘Inception’ (which is supposed to be very good). ‘Casablanca’ isn’t fair, it’s like test driving a sports car by balancing it on your bicycle and cycling it down the road. That's fair criticism. I will do a new one, I will, and report back. The very best bit of ‘Casablanca’ came right at the end. Bogart and Bergman were doing their thing at the airport runway. I got a bit distracted and looked around. It was foggy so I couldn’t see terribly far but, again, I was fascinated by the boundaries of the world so I set off across the tarmac. Perhaps because there was so little detail to fill in, the tiny details here were fantastic. The fog was wet and cold on my face and there was a hint of salt in the air. There was a tinge of fuel and tyre-rubber and the puddles seemed to seep into a hole in my shoe which exists in real life. That was neat. I came upon hangers and aeroplanes and out-buildings and they were all fully-explorable, or so it seemed to me. At one point, I heard a plane take off overhead and I wondered if it was Ingrid on her way at last. I wandered on through the cold buildings. Nobody was in them and nothing in particular happened but they were really there, in grainy black and white, and I happily shuffled through them until the alarm finally woke me, bleary-eyed, in the first light of morning.